Syfy’s The Magicians returns for its fourth season on Wednesday, January 23, 2019. The end of season three found the main players without magic and without their memories. 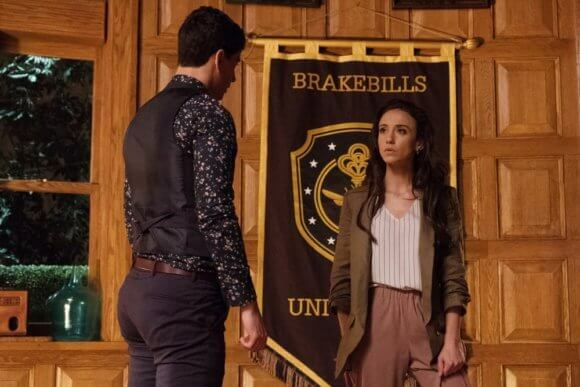 More importantly, Julia (Stella Maeve) gave up her incredible powers to help her friends and is now also unable to perform magic. During roundtable interview at the San Diego Comic Con, Stella Maeve teased that we’ll see Julia involved in a new relationship. Maeve also confessed she understands Julia’s sacrifice but was sad to see her lose her god-like powers so soon after embracing them. How is she feeling at the beginning of season four? Did you work with the actor playing you? What does that mean for pre-existing dynamics between the characters? Are you playing new dynamics as actors and then seeing this other story play out? How does this other Julia differ from the Julia we know? What else is in store for Julia? Some people enjoy the idea of Julia and the other Penny. Is that something you’d like to see? Are there any magical or sci-fi books or films that you can compare this upcoming season to? Like, Harry Potter, Lord of the Rings, or Narnia? Stella Maeve: “What would you consider the Library? What would you consider that in other [stories]? There’s some weird power hierarchies within this season. I don’t know how much of that I can really talk about and I don’t know that much about it, but I just know that Library may have power. They got the power. So, there’s no magic, right, and we’re trying to get the power. Besides the characters trying to get their memories back, is there a bigger storyline that takes us through the season? One of the really interesting dynamics on the show is Julia and Kady. What would you like see happen with that relationship? Do you have a favorite memory from any of the seasons? Do you pay him back? Julia’s gone through so much trauma. Is there anything you really want for Julia? Stella Maeve: “The thing is that I feel that Julia’s journey was acceptance and I feel like she made it to the other side. So now she’s just a part of the ride. She’s a god but doesn’t possess the god-like powers. She possesses still human emotions and the natural things we all have, just maybe on a different level. But I feel like the metaphor behind that is acceptance. It’s like all of these things can happen to us and they can be terrible, they can be wonderful, and we can have things ripped away from us and taken from us, and then we can have things given to us. And it’s like throughout it all we’re able to come full circle and accept who you are and where you are at any given point in your life.